RRB NTPC Recruitment 2019 Notification is released recently. Well, the Railway Recruitment Board officials gave three Starting Dates to apply for the 1,30,000 NTPC, Para-Medical Staff, Ministerial and Isolated & Level-1 Vacancies. Well, from 28th February 2019, 4th March 2019, 8th March 2019, 12th March 2019 interested contenders, can apply for Railway Recruitment Board NTPC Recruitment 2019. Remember the officials didn’t give the Final date to submit the application form. By going to the official site of the Railway Recruitment Board, all the interested contenders, can go ahead and apply for the RRB NTPC Recruitment 2019. As of the time of applying, an individual need to have all the Qualifications correctly. If not all such applications will be rejected. Check more details from the next sections. 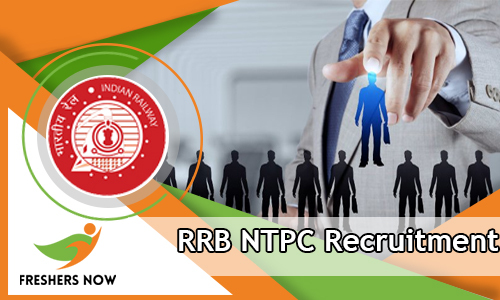 RRB NTPC Recruitment 2019 Notification information is clearly given in this post. People who are looking for Government Jobs can go ahead and apply for this RRB NTPC Recruitment 2019 before the final date. Railway Recruitment Board Level I Openings 2019 is a good chance for those searching for the Railway Jobs. We will update this post, once the officials gave the Final date, to submit the filled RRB NTPC Application form 2019. All the details about the Specifications are clearly given in the official RRB NTPC Recruitment 2019 Notification are shared in the coming sections. Contenders, who are willing to apply for the RRB NTPC Recruitment 2019, should have completed their Graduation or Degree from any Recognized Institute or University in India, as the Educational Qualification. Hope the information we provided about the RRB NTPC Recruitment 2019 is useful for the people, who are looking for the Railway Jobs. Check our site Freshersnow.com, for more such Latest Updates.